My ideal desire for the church is that abusive leaders seek council, admit their wrong, and apologize. The leader should step down for a season to reestablish trust and allow time for healing. Victims receive counseling and support. In the end everyone forgives. I know it’s easier said than done and that’s why I said my ideal desire. I’m an idealist, but that’s for another post at a later time. However, I do think that reconciliation is possible when everyone chooses to forgive. Un-fortunately forgiveness doesn’t come that easy to most of us and it’s because our sinful nature holds us back with pride. Forgiveness is a choice not a feeling. Forgiveness is hard work because it’s in our human nature to want to make someone pay for what they have done. We demand justice. When wronged by leaders in the church, it’s so easy for us to stand before God with bitter hearts, asking that the abuser be punished. I have been a Christian for over forty years. I traveled through seven churches and they all had an issue with a leader. No matter who was right or wrong, fellow Christians including myself judged harshly. Several years ago I was involved with a group of Christians that started a church. We trusted our Pastor until we realized that he was twisting the word of God around to control and manipulate us. He participated in sinful acts and justified it with his own doctrine. He took advantage of his position and abused the vulnerable. This Church could no longer stand and it literally fell in sinking sand. Our Pastor refused to change and therefore he was not safe for us to be around. Reconciliation was not an option for us. I chose to forgive anyway. God forgives me and I want to live my life forgiving others too. When I forgave my abusive Pastor, I set myself free from anger and hate. My aching heart healed as Godly council helped me walk through the forgiveness process. Counseling helped me process confusion and brokenness. I felt heard and affirmed by loved ones as I shared my story about the abuse that happened in the church. I received acceptance from friends in a time that I felt rejection and failure from my experience. No one judged me when I shared my mistakes and sin. Friends didn’t laugh at me when I talked about how I was taken advantage of in my vulnerability. Instead they gathered around me and offered hospitality. Through my recovery I was loved dearly. Now I attend an awesome church with my husband and children. I’m happy and I’m growing. So true, Lisa. Forgiveness is a choice, not a feeling. There are hurts in my life that took me so long to forgive, and even after I thought I’d forgiven I wondered why I still had these feelings of hurt creep up when triggered. I’m so glad you made this point. I’m an idealist too, although it’s lonely sometimes. 😉 Thanks for sharing! 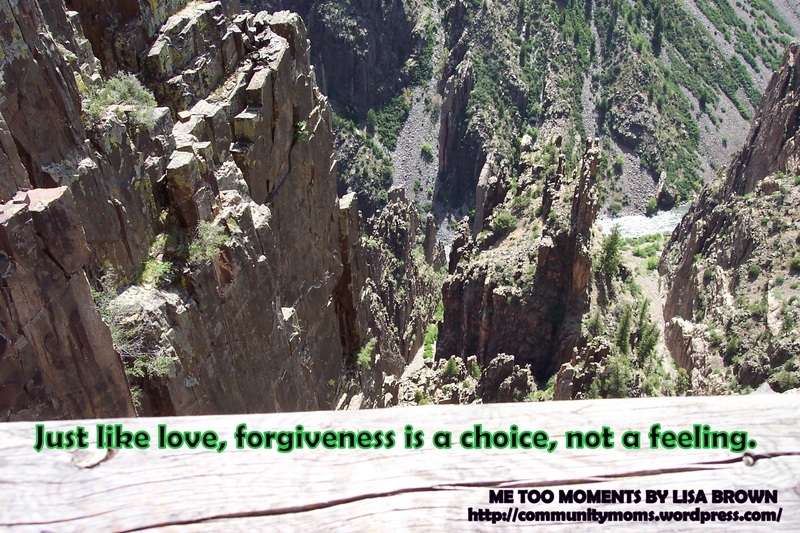 Hi Abby, Forgiveness does take time and hurt just doesn’t go away. I know exactly what you mean about hurt feelings creeping in when triggered. The whole forgiving and healing process is definitely a step by step moment of new realizations and understandings. And learning to be vulnerable and trust in the midst of recovering from past hurts. Thanks Abby for stopping by. It’s always a pleasure to have you here. I look forward to meeting you over at your blog later today.